This was a live recording event for a compilation CD that was going to be released in December 2007. I went to see Itou Asuka. There were around 30 people in the crowd. I sat in the first row, pretty much in the middle. There were 8 performers. Each performer sang two songs, and there wasn't much talk between the songs or the performers. They rushed it pretty well. 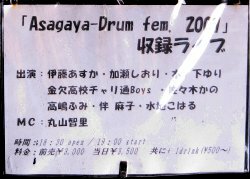 Asuka was the 5th performer, and her stage started at around 20:00. 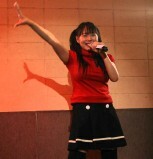 Asuka was wearing a red short sleeve top and black skirt. She also had black over-the-knee socks and long black boots. Asuka's songs were as follows. "Soredemo kimi ga suki" is Asuka's new original song. She wrote the lyrics herself. It's a pretty good song.. But I don't remember it so I have to hear it more at later events. At the end of the event, all of the performers came onto the stage to give a short comment about their song, and talk about their upcoming events. After the event, all of the performers sold some goods. Asuka sold individual photos for 200 yen each. There were 9 different photos. Photos allowed only during Itou Asuka's singing stage. I used my 20D and 24-205mm F4L IS, and took 185 photos (ISO1600), with 53 of them worth keeping. Since I was in the front row, the angle for taking photos was pretty bad. I also took some photos of Asuka after the event with my new IXY Digital 910IS compact camera. But compact cameras are so hard to use (control)..